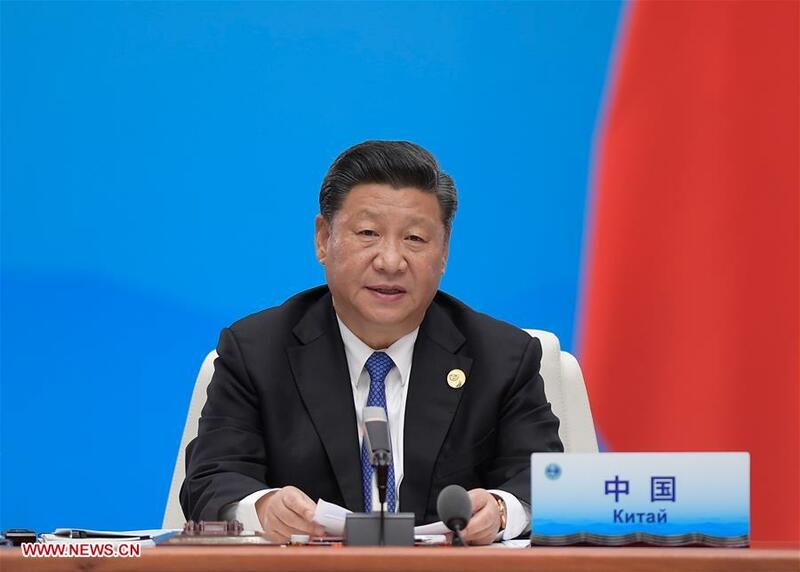 BEIJING, June 10 (Xinhua) -- Scholars and officials from around the world have been speaking highly of Chinese President Xi Jinping's keynote speech delivered Sunday at the Shanghai Cooperation Organization (SCO) summit in the eastern Chinese seaside city of Qingdao. In the speech, Xi called on countries involved in the regional bloc to work closely to build an SCO community with a shared future, move toward a new type of international relations, and build an open, inclusive, clean and beautiful world that enjoys lasting peace, universal security and common prosperity. Asanga Abeyagoonasekera, director general of the Institute of National Security Studies Sri Lanka, said Xi's call for moving toward a new type of international relations "captured the zeitgeist of the unfolding modern world order." "Asian nations, including Sri Lanka, should fully support this effort to create a more stable and better world order," the scholar said. Zivadin Jovanovic, an international relations expert based in Belgrade, Serbia, said Xi presented "positive, visionary views on how to approach global economic, social and security challenges." "Xi showed the world the SCO's role in global governance and cleared the way in order to reinforce peace, win-win cooperation in a multipolar world without geopolitical constraints and the relics of isolationism," he said. Jovanovic is the founder of the Belgrade Forum for a World of Equals and the Silk Road Connectivity Research Center, two think tanks. Maria Guleva, an associate professor in history who chairs the study of social development theories of Asian and African nations at Russia's St. Petersburg State University, said China seeks to undertake serious international obligations that consolidate its status of a major country in the world. "This is evident in a number of Xi's statements, which include the need to fill the gap of development levels among countries, and the announcement by Xi of (China's) contribution to the SCO Interbank Consortium," Guleva said. Xi announced in his keynote speech that China will set up a 30-billion-yuan (4.7-billion-U.S.-dollar) equivalent special lending facility within the framework of the SCO Interbank Consortium. Commenting on Xi's speech where he said the SCO should "champion equality, mutual learning, dialogue and inclusiveness between civilizations" and "follow the principle of achieving shared growth through discussion and collaboration in engaging in global governance," Tigran Sargsyan, former prime minister of Armenia, said those remarks showed that China is both full of self-confidence and aware of its strengths and weaknesses. Sargsyan, now chairman of the Board of the Eurasian Economic Commission, said such an attitude is helpful in solving problems effectively and searching for solutions in external cooperation based on equality and mutual benefit. It will also win the trust of the international community and lay the foundation for establishing long-term cooperative relations with other countries and achieving common prosperity, he added. B.R. Deepak, a sinologist and professor of Chinese studies at the New Delhi-based Jawaharlal Nehru University, thinks that Xi's emphasis on the "Shanghai Spirit" is very timely since protectionist and unilateral political approaches tend to "disrupt the existing regional and international order" and create conflicts among nations. The "Shanghai Spirit," a set of fundamental principles encompassing mutual trust, mutual benefit, equality and consultation, "could essentially be regarded as an antidote" to these approaches, said Deepak. Alina Grishikevich, deputy chair of the Belarus-China Friendship Society, highlighted Xi's remarks on building unity and mutual respect. "We should respect each other's choice of development paths and accommodate each other's core interests and major concerns. We should enhance mutual understanding by putting ourselves in others' positions and boost harmony and unity by seeking common ground and setting aside differences," Xi said in his speech at the SCO summit. The Qingdao summit is of great significance as it boosts mutual cooperation between member states and observers, said Grishikevich. Sheetal Babu Regmi, former secretary-general of the Nepalese government, said that he was impressed by the mention of cultural exchanges and the development of human resources in Xi's speech. If Xi's proposals in these two areas are earnestly implemented, the region will realize a substantial boost to its industrial upgrade and possibly become the center of the global economy, said Regmi. Avtandil Otinashvili, chief editor of the Georgian Newsday News Agency, said that Xi's speech was imbued with the spirit of cooperation, consultation and inclusiveness and "charts the course" for the future development of the bloc. Xi's proposals to improve global governance and his vision for a community with a shared future for mankind reflect the common aspiration of people in different parts of the world, and has offered a brand-new perspective as to why the world needs to abandon a Cold War mentality and seek global cooperation, he said.